Open House Festival is a hand-picked music and arts festival every August in Bangor, County Down. Events run throughout Northern Ireland all year round. 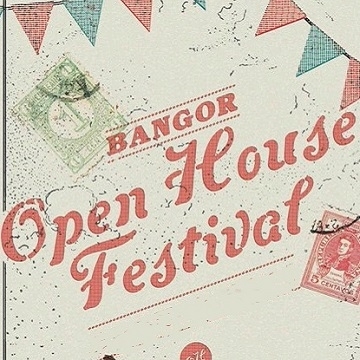 Open House Festival was established in Belfast in 1999 and moved to Bangor in 2013. It has been organically grown and tenderly looked after by two local people, Kieran Gilmore and Alison Gordon, who are still at the helm. Charity No: NIC103648 Company Reg No: NI42872. Bangor is a beautiful seaside town in County Down, just a quick twenty-odd minute drive from Belfast. With striking Victorian architecture lining a sweeping costal path, an ancient Abbey dating back to medieval times, parks, five golf courses, walled gardens and nearby beaches, the town is one of Northern Ireland’s loveliest places to live and visit. Bangor is a place of impressive historic significance dating back as far as 500AD, and of huge cultural importance. In its heyday, from Victorian times through to the 1970s, it was known as The Brighton of Ireland – a holiday destination brimming with dancehalls, showbands and ice cream parlours.